Grand Trunk Pacific, Fort Fraser B.C., Mile Post 1372.7 April 7, 1914. We continue our 97th Anniversary of the Last Spike, completing the second Canadian railroad. "This menues the beginning of a gigantic enterprise which, if completed as projected, will mean the addition of at least 3,500 miles of main line, to the 19,000 miles, in round figures, of track in the Dominion. A conservative estimate of an engineer puts 30 per cent, to this for sidetracks and yards, which would make in all 4,500 miles of additional track. Mr. C. M. Hays, president of the company, stated the other day that the workers who will be engaged in the maintenance and operation of the road will mean 20,000 persons added to the railway employees in Canada. If this number were only paid $2 a day each, on an average, it would require $14,000,000 a year to meet their wages and salaries. Taking, for a basis of computation, that the new road will extend from Moncton on the east to Port Simpson, Tucket Inlet or any other point on the Pacific Coast, and that the distance from east to west is approximately 3,500 miles, the material, rolling stock, et cetera, to be used in the construction, and the rough cost of these things furnish some astounding figures. In all there would be 7,000 miles of rails, that is if the rails used for the main line were placed end to end in a straight line they would reach 7,000 miles. [ed note: Sources vary; 33' also 39' lengths] This would mean 1,232,000 rails, or 492,800 tons. In every tie laid there are at least four spikes driven. It would, therefore, take 42,000,000 spikes. There are two angle bars used for every rail and four bolts, four washers and four burrs used for every pair of angle bars, which figures up to 2,454,000 angle bars, and 4,928,000 each of bolts, washers and burrs. Besides these things, there are fish plates, guards and tie plates which would number into the millions. It is estimated 500 locomotives will be required. At an average cost of $15,000, they would cast $57,500,000. At an average of $700 each, 30,000 freight cars would cost $21,000,000. 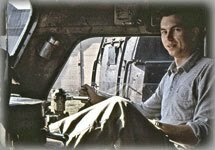 The passenger cars at $10,000 each for 500 would come to $5,000,000. 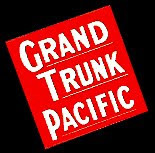 The Grand Trunk has now 909 locomotives in its service, and 38,016 passenger and freight cars. In addition to these materials and rolling stock, there are many other things to be considered in the road. Bridge and trestle timber, bridge steel, stations, telephones, switches, semaphores, water tanks, and terminal facilities. These figure up into the millions of dollars. There would also be fencing, which will cost, it is estimated, on an average of $425 a mile, which would amount to $1,487,500. A telegraph line extending along the road from ocean to ocean would cost in the neighborhood of $700,000, for it is calculated the cost per mile will be $200. which includes the price of material and the cost of building. The poles alone would come to $357,500, reckoning that there are 33 poles to the mile, which, at an average of $3 a pole, would make that sum. There are many other items to be counted in the construction of a transcontinental highway, but what details have been given are sufficient to show the greatness of present-day commercial enterprises, and the activity which may be justly expected in Canada for the next few years, as a result of vast railway development." 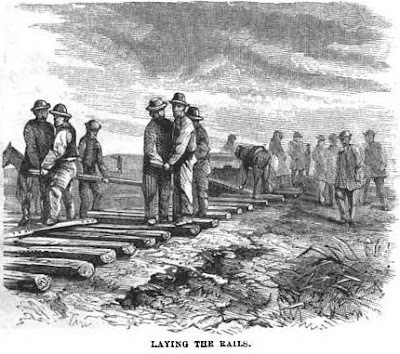 The backbreaking step of clearing and grading left miles and miles of smooth surface - grade - upon which the track laying crews laid out and assembled the ties to the rails. The "time honored" basic system of using carts and wagons to advance ties, rails, tie plates and spikes along the grade. For tracklaying by horse cart and wagon, a convenient arrangement is to have a gang of 55 men in charge of two foremen, equipped with three rail cars, one horse, and two portable turntables. One turntable is placed at the loading and the other at the unloading end of the track. An ordinary load for the rail car is six rails, and a full supply of ties, splice bars, bolts, nuts, washers and spikes for that number of rails. If the driver reaches the front before the unloading gang has unloaded all the material from the first car he puts the turntable in position ready to haul the car off when empty, but if the gang finishes unloading before he arrives it runs the empty car off, ready to be hauled back. On returning to the loading end with the empty car, the driver puts the turntable on the track, and runs the car off onto a pair of ties. He then hitches the horse to the loaded car and goes to the front, while the loading gang runs the empty car back into position for reloading. With such a gang of good men under a smart foreman, a mile of track may readily be laid in two days. Clearly, when faced with 4,500 miles of track to be laid, there had to be a faster, more efficient system to lay track from point "A" to point "B." IIRC my history of the Transcontinental tracklaying efforts, a good gang could advance the track 10 miles/day in the flat prairie, and over a mile in the mountains. The facts do not seem to support the 10 mile per day claim. True, the Central Pacific staged a "race" in which ten miles of track were laid, using 4,000 laborers and pre-positioned materials. But in my opinion, that was carefully orchestrated publicity, promoting the unique transcontinental accomplishment. But the reality is two to three miles per 10 hour day, substantiated by numerous sources.